Vote for your favorite #madREskillz! Editor’s note: The #madREskillz finalist who receives the most votes in the poll below will be featured in an Inman News story. Voting closes at 8 a.m. PDT Thursday, Aug. 14. 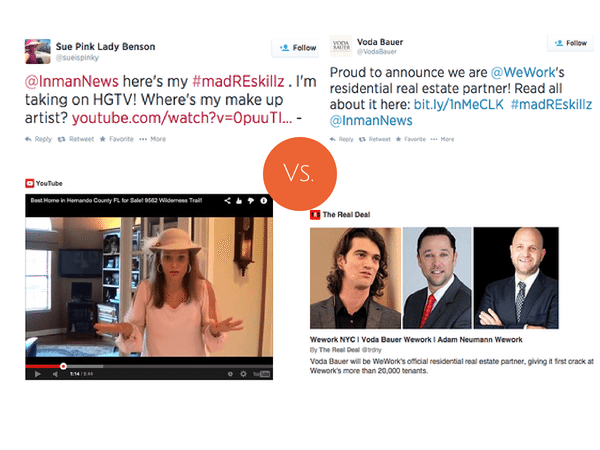 Last week, a coconut mailer proved to be the winning lead gen strategy over a home evaluation video player. Who will be this week’s #madREskillz winner? 1. If you live in Tampa, you probably know Sue Benson, or “The Pink Lady.” Sue’s hot pink branding, which extends from her website and Twitter handle all the way to her headgear, make her a clear standout in the real estate world. Sue’s #madREskillz entry showcases her highly stylized video tours. 2. Voda Bauer Real Estate has set up shop in WeWork, a co-working space in New York City that specializes in startup culture. Their unique brick-and-mortar location gives the new brokerage unchartered access to WeWork’s 20,000 tenants — a coup in NYC’s aggressive real estate scene. Voda Bauer plans to offer free consultations and lunch-and-learns as a way of finding potential clients within the walls of WeWork.